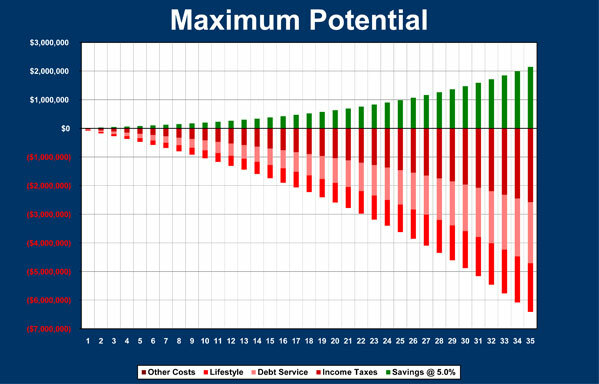 The Maximum Potential calculator helps clients understand the importance of savings in their investment strategy through the illustration of full capacity minus tax implications, debt service, life style and inflation. Shows how chasing higher rate of returns is not as effective as reducing costs thereby providing for more savings. A person earning $100,000 today with 35 years ahead of them to earn a 4% increasing income to invest at 5% net could have a potential of 16 million if they didn’t eat or pay taxes. Since they pay taxes and eat and have debt they only save 3% so they have $494,527, a little more than one years income. If we can reduce debt service from 34% (the average family) to 29% by re-structuring how one pays debt, then savings goes up and asset base rises. If we can also trim back the taxes we pay by structuring our assets more effectively, the asset base doubles.